Historically, Halloween has been a night where many alcohol-impaired drivers take to the road. In 2009, nearly half of the highway deaths on Halloween night involved impaired drivers. This is especially scary because on this night our children trick-or-treat across our streets and through our neighborhoods. However, this year many communities across the country are taking actions that should scare alcohol-impaired drivers — they are stepping up enforcement with sobriety checkpoints and targeted law enforcement efforts. Last month, I visited two sobriety checkpoints in Northern Virginia. They were the result of a collaboration of the Fairfax County Police, the Prince William County Police, and the Virginia State Police. These checkpoints covered both directions of one busy road and successfully identified numerous alcohol-impaired drivers. The overwhelming police presence demonstrated the community’s zero tolerance for alcohol-impaired driving. Halloween is a night when the police will be out in full force. There is no need to drive after having too much to drink. As you and your friends plan your Halloween celebrations, before you even leave plan on how you will get home safely. Identify the designated driver before you head out or bring enough money for a cab. There are also free services, such as the SoberRide program in the Washington, DC area, that you can use. 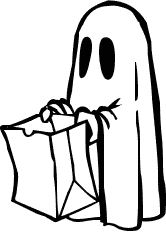 Please make Halloween safe for everyone and let the “scaring” be done by the ghosts and goblins and not by the drivers on the roads. Earlier this week, I joined the professionals who safely transport our nation’s children on all those big yellow buses to celebrate the unparalleled school bus safety record. School buses are, by far, the safest way for students to get to school, home, and to a host of school-related activities. Here’s a measure of school bus safety: Among student fatalities during normal school hours, more than half were traveling with a teen driver, under one-fourth with an adult driver, and just 1 percent were traveling by school bus. 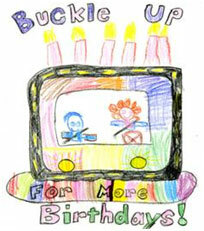 In addition to transporting our children safely, there’s another big benefit to the big yellow bus. It would take 36 cars to carry the students who travel on one school bus. 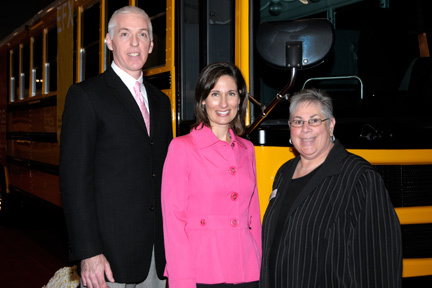 On a yearly basis, school buses keep an estimated 17.3 million cars off the roads surrounding our schools. Here’s a big shout out to all the professionals responsible for taking such good care of our students. Here’s what I told the professionals at the National Association of Pupil Transportation on Tuesday morning. This week is National Teen Driver Safety Week — and of all the lifesaving weeks in the year — this is one that can make a real big difference. Traffic accidents account for 36 percent of all deaths among 15 to 20 year olds. In fact, car crashes kill more young people every year than suicide, drugs, violence, and alcohol – combined. This is why the NTSB placed Teen Driver Safety on its Most Wanted List. Teen Driver Safety is one of the NTSB’s highest national advocacy priorities, and an area in which we see far too many states moving far too slowly. This week, I had a wonderful opportunity to address the National Organizations for Youth Safety (NOYS) National Teen Distracted Driving Summit. I applaud NOYS for its aggressive stands on underage drinking and driving, seat belt use, and Graduated Driver Licensing. As I said in my remarks at the National Teen Distracted Driving Summit, it is in the area of Graduated Driver Licensing where NOYS can make an enormous, and immediate, impact. You don’t have to wait on your state legislatures to change their laws on GDLs, or underage drinking and driving. You can reach out to your peers directly and educate them on the right behaviors, the safest behaviors. It’s that personal, one-on-one interaction that can effect meaningful change. To help you — as a teen, a parent, or a friend or neighbor — to take action to improve teen driving safety, here’s a first step. Watch this riveting video that NOYS showed at the summit on the importance of teen driving safety. You can bet that I am going to make sure my 17-year-old watches it, too. 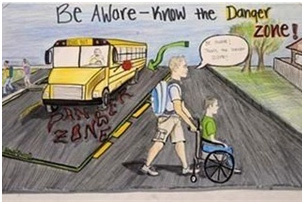 The theme of this year’s National School Bus Safety Week (October 17 – 21) is “Be Aware — Know the Danger Zone.” Pictured is the winning poster in the National Association of Pupil Transportation’s (NAPT) annual safety poster contest. You probably know the danger zone is the area around the bus where students can get hit by passing vehicles and from vehicles on the shoulder of the road. Yet, thanks in large part to school bus community’s outstanding safety outreach, including poster contests and national safety week, traveling on the big yellow bus is the safest way for our students to get to school. Next week, I am speaking at NAPT’s Annual Summit. I look forward to congratulating the many professionals in the pupil transportation community for their outstanding work to produce an unequalled safety record. School bus accidents are rare. And, when they do happen, because of the school bus community’s commitment to safety, they seldom result in fatalities or serious injuries to bus occupants. It is up to everyone on the road to follow traffic laws and safe practices when approaching school buses. So, the next time you see a big yellow bus, be aware and know the danger zone. This week, I was in Orlando, Florida, for the ITS World Congress. ITS stands for Intelligent Transportation Systems, which, in short, means using technology to improve transportation safety and efficiency. Before I spoke at a session about using technology to improve safety for aging drivers, I had the opportunity to see a demonstration of the Department of Transportation’s Safety Pilot program. Safety Pilot involves testing connected vehicle technologies to determine their effectiveness in reducing crashes. Vehicle to vehicle (V2V) or “Connected vehicles” enables vehicles to “talk” to each other. For example, I rode in a Mercedes Benz and then a Ford with Gregory Winfree, Acting Administrator of the Research and Innovative Technology Administration, at the ITS demonstration. These were just two of the many cars from eight different manufacturers that were equipped with V2V technologies at the testing site. 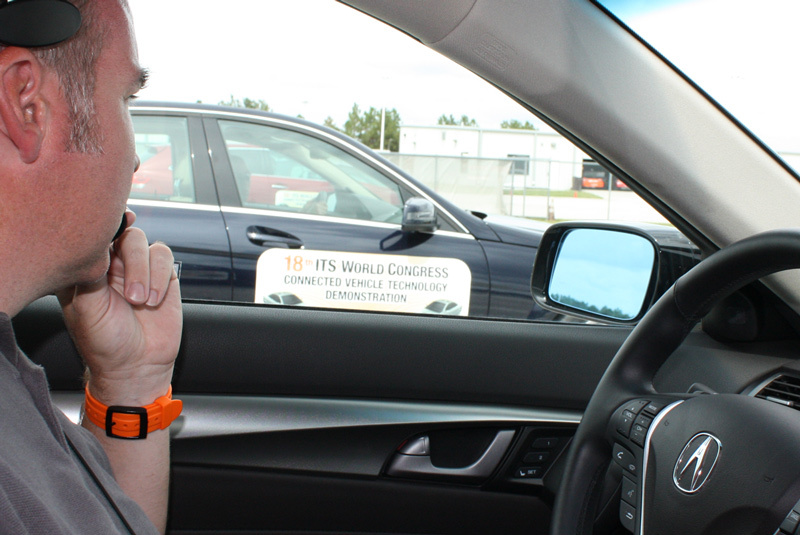 During my test ride, I experienced vehicles that assisted the driver with blind spot detection and other warnings to prevent collisions through aural, visual or haptic alerts. These were not self-driving cars, but rather technology assisting the human driver in making decisions. Connected vehicle technology is emerging and holds promise to help improve safety on our roadways. With 33,000 annual fatalities on our roads, this is important technology to pursue. We need to use all the tools in our toolkit — including putting down our cell phones and listening to alerts — to save lives and prevent needless tragedies. I commend the Department of Transportation’s RITA and all the manufacturers and organizations involved in the pilot for the work they are doing to test and deploy technology to improve safety on the road. Did you know that older women often give up driving earlier than they should? Or, that older drivers have far fewer accidents than teens? 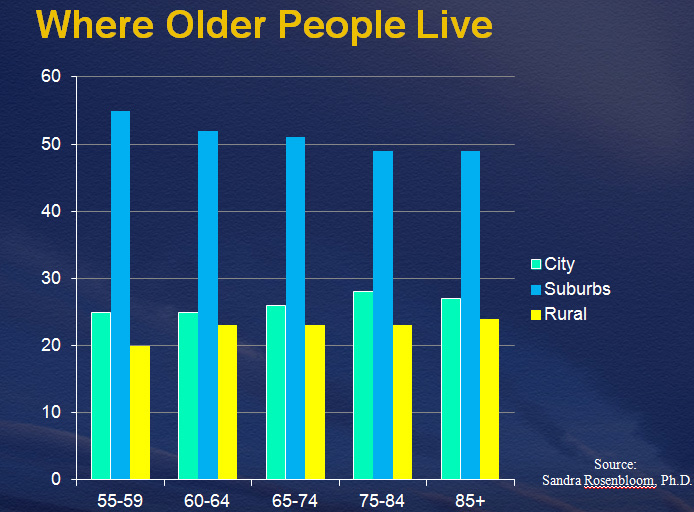 And, that three-fourths of older Americans live in suburban or rural areas where public transportation is limited? Those are just some of the things we learned at last year’s NTSB forum on Safety, Mobility, and Aging Drivers. We gathered a host of experts from across government, research, and industry to talk about safe mobility for the elderly. Today, I am speaking on Safety and the Aging Population at the ITS World Congress in Orlando, Florida. I suggest the intelligent transportation community take a two-pronged approach to improve road safety for older drivers: prevention and mitigation. Using safety technologies, such as electronic stability control, lane departure warning, forward collision warning, will especially benefit the elderly. Mitigation is also important since older adults are more likely to be injured or die as a result of a crash because their bodies are fragile. The ITS community should think about safety improvements with the older driver in mind, because when safety is improved for the elderly it is improved for everyone. That rising tide of safety will make a huge dent in saving lives in the most essential and most fatal form of transportation. Monday was Put the Brakes on Fatalities Day. It’s a day to be ambitious and work toward zero fatalities on our nation’s roadways — one day at a time. This campaign brings together State, Federal, private industry, and safety advocates from across the country to spread the message on what causes transportation fatalities, especially highway deaths, and how we can avoid them. As in years past, this year’s education efforts focused on driver behavior, vehicle safety, and roadway improvements to reduce traffic deaths across the country. This campaign is supported by 21 states. Pictured is one of the winners of the 2010 Kansas poster contest. This child’s poster makes a powerful point, especially since traffic accidents are the leading cause of death for toddlers through age 34. Sadly, many accidents, injuries, and deaths are the result of a tragic choice — the choice not to use a seat belt or to properly restrain a child, the choice to drive distracted, the choice to drive impaired by alcohol or fatigue. This day is an opportunity for everyone to remember that each one of us has a personal responsibility to make safe decisions when we are behind the wheel. More people die on our roadways than in all other forms of transportation combined. This is why the NTSB placed Addressing Alcohol-Impaired Driving, Teen Driver Safety, Motorcycle Safety, and Addressing Fatigue on our Most Wanted List. Every day — drive safely and put the brakes on fatalities.